Michel Cluizel Noir Infini Couverture Bitter chocolate discs, 99% Cocoa. Note: With 99% cocoa, a very small amount of sugar, orange blossom, vanilla and spice, this extra bitter chocolate has a special unique intense flavor. 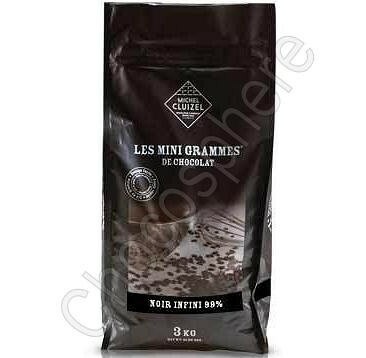 Michel Cluizel's traditional couvertures contain no lecithin emulsifiers of any kind, and are now molded into "Mini-Gramme" format, smaller discs (about the size of a typical cookie chip) that make measuring and melting even easier!Net Wt.3Kg / 6.6 Lb bag.